← 10 Portman Square | W1: Can a Name Change Clean up a Dirty Image? Many years ago pigs roamed what is now modern Marylebone. This image might be mistaken for a still surviving pig stye. But this is a British Land site under the proud stewardship of McAleer & Rushe. In fact, it might also be mistaken for a war zone. The site is 10 Portman Square (formerly known as 2-14 Baker Street). 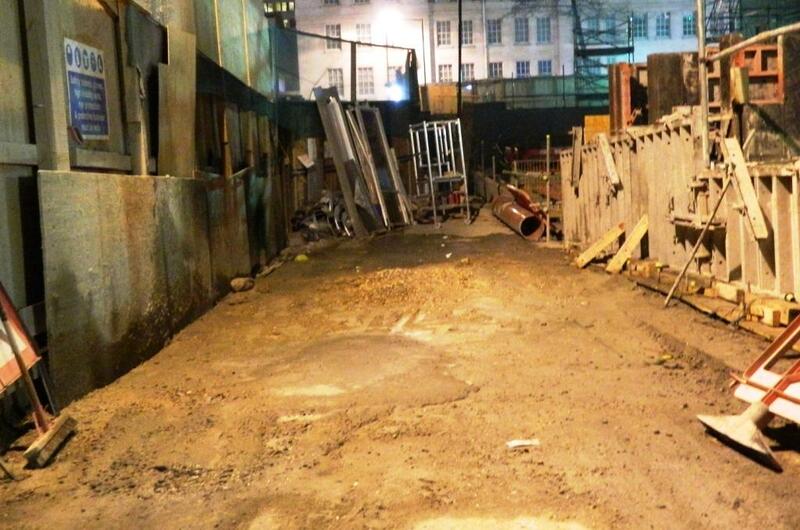 This photograph is of the public highway at the rear of the site from Robert Adam Street into Baker’s Mews. And this is the filth that adjoining and local residents have to live with on an occuplied roadway taken over with no consultation. Would it happen anywhere else in Westminster? This proudly displays a ‘Considerate Builders Scheme’ notice on the perimeter at Fitzhardinge Street. It is far from that. Starting January 2011, this site has been an active and real danger to local residents, to vehicular traffic, to pedestrians, cyclists and members of the public. Late February several residents had their cars damaged by concrete from the site. One of the less dangerous incidents on the site to date. On the 14th March 2012 a more serious incident happened – and one that could have had very serious consequences. This time a substantial spillage of what appears to be concrete happened at the site perimeter between Robert Adam Street and Baker’s Mews. This spillage is evident both inside the site and outside. The photograph on the right is of the public highway and taken approximately 8 hours after the spillage was evident outside the construction site perimeter. The concrete outside the site is evident in the unprotected narrow pedestrian pavement between Robert Adam Street and Baker’s Mews. Its effects also affected the roadway in Baker’s Mews. This pavement is used by young children, by mothers and babies and general members of the public. Local residents suffered concrete splashes on their cloths from this incident – but it could have been much much worse. One also wonders whether it is ‘best practice’ for a construction site to dispose of concrete spillage down a public drain – as happened on the 14th March at this construction site? In October of 2011 Westminster City Council Street Licensing division were specifically made aware of the danger to to public – and naming this exact pedestrian passageway. There was clearly a danger to the public. There had already been falls of building material from the site onto this pavement. A request was made to oust McAleer & Rushe from their occupation of the public highway. Falling that, a request was made to install a covered walkway for pedestrian safety. No action resulted. British Land also refused to deal with the concerns – despite several earlier major health and safety failings on their site. McAleer & Rushe adopted the same stance. Will it take a death or serious injury before anyone acts on health and safety on this site? Is Westminster City Council really a democratic institution? Why are public and resident views and ligitimate concerns not being acted upon? Why is a company the size of British Land willing to allow it’s brand and reputation to be put at risk by the technically bankrupt McAleer & Rushe? Why is this site continued to be given free rein on what is one of the main Olympic 2012 routes? Though this site, in this photograph, may look like something from World War III, this is not Britain at War. The public and residents have the right to be safe, are entitled to not be put at risk and entitled to have ligitimate concerns dealt with BEFORE incidents such as the one on the 14th March happen. Notes to Readers: Further information about this construction site can be found on other posts on this blog – and also on the NAMAWINELAKE Blog. This entry was posted in Construction, Construction Deaths, Death, Disabled Access, HSE, Legal Action, London, London Mayor, London Olympics, Mayor of London, McAleer & Rushe, McAleer and Rushe, Mob, NAMA, NAMA Wine Lake, NAMAWINELAKE, New England Quarter Development, Parking in London, Retail Development, Street Parking in Marylebone, Street Parking in Westminster, Tax Avoidance, Thug, Thuggery, Tourism London, Uncategorized, West End, Westminster, Westminster City Council, Where to park in London, World War III and tagged 10 Portman Square, 2-14 Baker Street, Baker Street, Boris Johnson, British Land, Business, Children, Considerate Builders, Construction, construction site safety, Death, Health and Safety Executive, HSE, Injury, London Olympics, Marylebone, McAleer & Rushe, NAMA, National Asset Management Agency, Northern Ireland, Occupational safety and health, Pedestrian, Portman Square, public hazard, Road surface, safety, Thugs, West End, Westminster City Council, World War III. Bookmark the permalink.